With All-In Luxury®, this Punta Cana getaway makes sure all-in is literally what you get. All-inclusive amenities are great for all and anyone, from families, kids, teens, couples, or singles looking for a fresh spin on fun in the sun. Built for all ages, Royalton Bavaro is situated on one of the best beaches in the world and has many different avenues to total fun. It also puts new meaning to being lazy in paradise. Just as they are literally all-in, they are literal when it comes to being lazy too – in a good way! Guests staying here get to take advantage of a number of unique activities including a splash park and a sprawling lazy river that’s more than 1,200 feet long. To raise the lazy stakes, hidden within this slow-paced waterway is a grotto bar, the perfect place to hop off for a refreshing cocktail. In other words, getting your lazy on is a thing of beauty at Royalton Bavaro, and is definitely encouraged! For some fun at a faster pace, guests of all ages can also get surfin’ on the FlowRider®, the ultimate surf machine that’s almost as exhilarating to watch as it is ride. Perfect for experienced riders or beginners, getting the hang-ten of this machine is a thrill the whole way. Golf lovers or those just looking for a cool, casual activity to pass the time get to putt in paradise on the nine-hole mini golf course, and adults get to roll the dice at the casino, which features a variety of slot machines and table games. Kids and teens are not left out, as they get to enjoy their own space for some peace and quiet (or peace and noisy – let’s be real) at the Clubhouse Kids Club and Hangout Teens Club, featuring on-screen characters Max & Ruby™ for the little ones and Playstation lounges, All-In Connectivity™ with high-speed WiFi, billiards, and Ping Pong tables for the teens. The Royalton Bavaro clearly exceeds expectations in the activities department, but having all those great amenities like the lazy river doesn’t mean they short you on the other things. In fact, the accommodations, service, and cuisine rival the best. The All-In Luxury® includes elegantly styled suites in three distinct sections, including the Diamond Club™ section for those looking for an adults-only vacation in tranquil serenity. This exclusive experience is equipped with a premium level of service and special access to à la carte restaurants, bar areas, a swimming pool, and pristine areas of the beach, with butlers helping out at every turn. At the Royal Spa, relaxation and rejuvenation are guaranteed, and the reservation-free dining with chef-curated menus make for a culinary journey to sweeten the pot. Let your taste buds free to roam an entire world of flavors throughout several restaurants on site. From buffet style to à la carte dining, Tex-Mex, Mediterranean, Italian, Asian, and Brazilian cuisines are all represented, plus a steakhouse serving up cuts exactly how you want it. And the 24-hour room service makes indulging easy and convenient at any time. 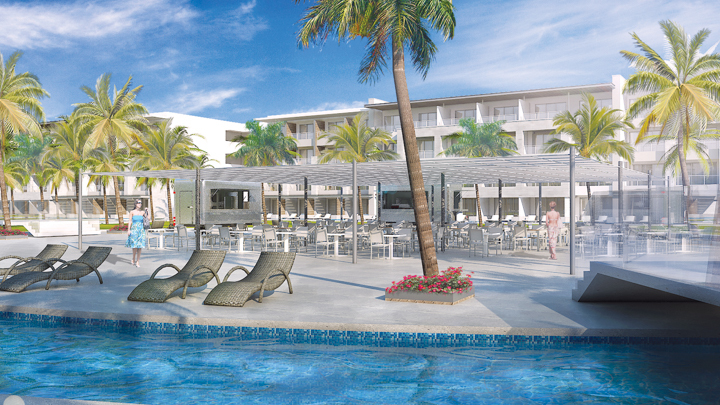 For that legendary Punta Cana experience with the added bonus of having fantastic outlets for fun right on site, the Royalton Bavaro is the evolution of fun in the sun. Contact your local travel agent to book this fun-and-relaxation-filled property that’s perfect for all ages. But you’ll all act like kids.